Getac's fully rugged tablet together with Leica's Zeno Mobile software and GG04 plus smart antenna provides highly accurate data collection in all conditions. TELFORD, England, Sept. 11, 2018 /PRNewswire/ -- Getac today announced that Leica Geosystems has selected its fully rugged ZX70 Android tablet as hardware of choice for the new Leica Zeno GG04 plus Tablet Solution. The new partnership will allow Leica Geosystems to bring comprehensive geospatial data collection capabilities to its customers in all terrains and weather conditions such as utilities, public services, transportation and construction. Leica Geosystems has been creating professional measurement and survey solutions for almost 200 years and is synonymous with instruments of the highest quality. More recently, the company has developed a range of new software and hardware including its Zeno Mobile data collection app and Zeno GG04 plus smart antenna, designed to help customers capture highly accurate geospatial data quickly and effectively in the field. 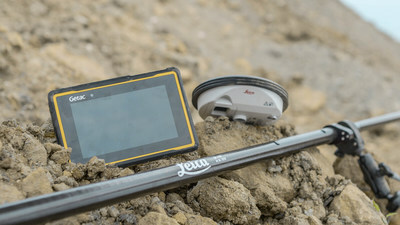 By combining these innovative products with Getac's fully rugged ZX70 Android tablet, Leica Geosystems has created a solution that offers industry leading measurement accuracy, connectivity and durability in a single, comprehensive package. "The Getac ZX70 provides the missing piece of the puzzle for the complete surveying solution we wanted to bring to our customers," said Alexander Fischer, Senior Product Manager for Asset Collection & Management, Leica Geosystems. "Not only is it extremely durable and reliable, but the powerful Android operating system and flexible connectivity make it the perfect partner to our Zeno Mobile software and GG04 plus smart antenna. Customers can be confident of optimal performance, regardless of the environment they're in or the weather conditions faced." Compact and powerful, the Getac ZX70 fully rugged Android tablet is easy to hold and comfortable to use with just one hand, making it ideal for demanding field surveying work. The Android operating system seamlessly supports Leica's Zeno Mobile software, allowing for high accuracy Global Navigation Satellite System (GNSS) positions to be utilised and rich attribute data to be collected to be collected easily in the field. It also means any authorised Android app can also be installed on the device, depending on the required workflow or back office systems used, bringing a high level of usability and familiarity straight out of the box. Additional key features include the 7" IPS display, which is easy to read in all environments, including direct sunlight, while the LumiBond 2.0 touchscreen allows for full operation of the tablet in the rain and even with gloves on, essential for outdoor surveying work. The Getac ZX70's integrated 4G modem can transmit large data files quickly and easily, even from remote locations. The fast, stable and reliable data connection also allows users to effectively utilise Hexagon Geosystems' HxGN SmartNet correction service, enabling accurate GNSS measurement to within one centimetre. Finally, Getac's best-in-class bumper-to-bumper warranty, including accidental damage, means Leica's customers can purchase the new Zeno GG04 plus Tablet Solution in complete confidence that their investment is fully protected. "The ZX70 offers best-in-class durability, connectivity and usability, and has been designed to withstand shocks, drops, rain, vibration and more, making it the perfect hardware partner for Leica's industry leading Zeno Mobile software and Smart Antenna," says Amanda Ward, Director, EMEA Product and Solutions at Getac. "In the past, tape measures were used to triangulate positions in the field, which is neither reliable nor accurate. The combination of Getac's ZX70 tablet with the Leica Zeno Mobile software and GG04 plus smart antenna saves time for both field and back-office teams, whilst the high-accuracy GNSS increases the validity of asset data and reduces the risk of errors." Learn more about how Getac's ZX70 tablet is powering Leica Zeno GG04 Solution on utilities.getac.com.